A flawless, brilliant smile is an indication of beauty, health and vigour. A tantalising smile is one of the first things that people notice. This is why everyone wants whiter teeth- so they can have that picture-perfect, attention-grabbing smile. Here at Marsfield Dental, we are on a mission to help your pearly whites sparkle while keeping you safe. To help you make wise decisions, we’ll provide you with essential tips and important facts that you need to know when it comes to teeth whitening in Sydneyand all throughout Australia. Below are some of them. Many people rely on over-the-counter products from whitening strips, toothpastes and gels, to bleaches and mouthwashes, thinking that these teeth whitening solutions are enough to prevent stains and plaques and consequently attain beautiful pearly whites. But think again. Although some of these products can make your teeth one shade lighter, these products only remove surface stains. Experts say that if you’re not taking proper care of your teeth, then you won’t get very effective whitening from any of these products. This means that your teeth need to be in healthy condition first for the over-the-counter products to work effectively. Hence, if you want whiter teeth, it’s best to visit your dentist who can offer you some tips on how to keep your teeth healthy as well as provide you with light-activated whitening treatment that can make your teeth three to eight shades lighter. 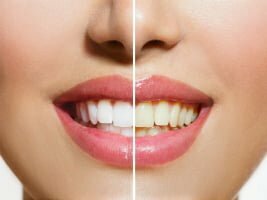 Visiting a professional to undergo a teeth whitening procedure is the best and the most effective way to eliminate plaques and stains as well as lighten teeth, helping you achieve sparkly, pearly whites. Going to your dentist is safer, more effective and most of all, offers the best results compared to visiting salons and beauty shops. Apart from teeth whitening, your dentist can perform procedures to restore the normal shape and function of your teeth, such as tooth extraction, root canal therapy, filling and dental or dentures implants. Going to salons or beauty shops for teeth whitening treatment sessions may cause temporary or irreparable damage to your pearly whites. The wrong use of whitening agents may inflame your gums, cause blisters and heighten teeth sensitivity, thereby causing discomfort while eating or drinking. What’s even worse is that when the wrong procedure or treatment is given, you’ll end up with uneven teeth colour. This is why it’s recommended to consult a licensed professional who knows the best treatment to help you attain a sparkling, beautiful smile. In your quest for brighter, whiter teeth, it’s best to make sure that the treatment or procedure that you’ll be choosing is guaranteed safe and effective. Speak to your dentist —this professional is the only person who can help you when it comes to finding the ideal solution to achieve sparkly, pearly whites. If you’re looking for a cosmetic dentist in Sydney who takes genuine care of the well-being of her patients while working at her best to get that beautiful smile—call us today. Let Dr. Choo and her friendly staff will look after you and those pearly whites!